Follow this link for fire safety tips for the cottage or hunt camp. Follow this link for information about the proper use of smoke detectors. 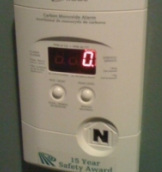 Follow this link to learn about the dangers of Carbon Monoxide.